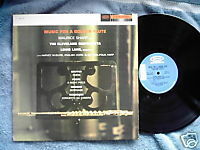 Epic BC 1116 vinyl stereo LP (1960) Maurice Sharp, flute with The Cleveland Sinfonietta Louis Lane, conductor Music For a Golden Flute The long out-of-print album “Music for a Golden Flute” featuring brilliant performances of orchestral versions of Charles T. Griffe’s Poem, Arthur Foote’s Night Piece, Arthur Honegger’s Concerto da Camera for flute and English horn with Harvey McGuire, and the Howard Hanson’s Serenade for flute harp and strings. Excellent condition. Quiet pressing with one light scuff, promo sticker affixed to label, pen marks, ink stamp, and slight creases on cover.